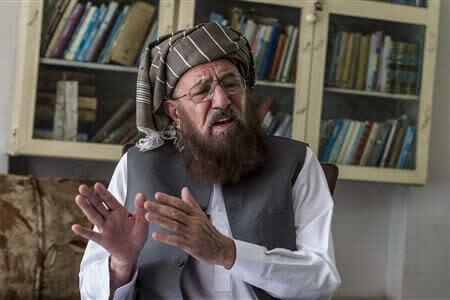 AKORA KHATTAK, Pakistan (Reuters) - He is known as the Father of the Taliban, a radical Pakistani cleric who calls the Taliban's one-eyed leader an "angel" and runs a seminary described as the University of Jihad. "Give them just one year and they will make the whole of Afghanistan happy," Haq said. "The whole of Afghanistan will be with them ... Once the Americans leave, all of this will happen within a year." Despite Haq's openly pro-Taliban views and connections, his seminary is recognized officially in Pakistan - a symptom of Islamabad's long-running duality over the Taliban issue. Haq would not talk about this publicly but he is believed to be close to the Pakistani security forces - a legacy of an era when Pakistan sponsored movements and supported militants, including Osama bin Laden, fighting Soviet troops in Afghanistan. Kabul's government has long accused Pakistan of playing a double game and harboring militants on its soil while publicly condemning extremism - a charge Islamabad fiercely denies. One of them, Mullah Mohammed Omar, later took advantage of the chaos that followed the Soviet withdrawal in 1989 to found the Taliban movement - a period often recalled with nervousness ahead of next year's drawdown of U.S. forces from Afghanistan. Fenced off from the hustle and bustle of the outside world by high walls and barbed wire, it houses 4,000 male students in its multi-storey concrete buildings.